Once upon a time Polaroid reinvented photography as we knew it with the instant camera. The tiresome task of waiting days to develop film was reduced to a few shakes of the wrist and a minute-or-so wait. After spending a few minutes trying to get an accurate picture out of the Polaroid FLM-2601 LCD television I wanted to shake the TV with the same vigor I would an instant Polaroid photo print. Polaroid began selling TVs manufactured by Petters Company under the Polaroid brand, slid into bankruptcy, and was bought out the Petters Company in 2005. LCD TV Buying Guide tested a smaller Petters-manufactured model earlier, the 20-inch Polaroid 2000 LCD TV, and was unimpressed. The larger Polaroid FLM-2601 LCD TV, Polaroid's 26-inch LCD television that we review here today, left us disappointed too. Polaroid also offers a 32-inch model, the FLM-3201, which we haven't gotten our hands on yet. Given our bad experience with the rest of the Polaroid TV lineup, we won't be rushing out to buy the FLM-3201 anytime soon. Polaroid TVs cost approximately $400-600 less than similarly sized models from Sharp and Sony, and it's easy to see where they cut corners. Cheap materials, a poor user interface, and a sub-par picture detract from the Polaroid FLM-2601's attractive price. The FLM-2601 LCD TV has an appealing design. A black plastic frame surrounds the screen, helping the viewer's eye to perceive contrast better. Silver speakers fan out from both sides of the screen and the TV is supported by a silver, tilting table stand. 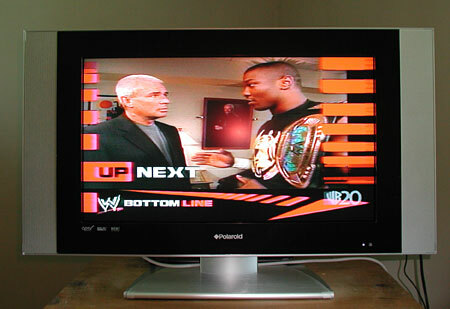 A purple power-indicator on the bottom of the screen melds well with the TV's overall design. Unfortunately Polaroid chooses to clad the bottom of screen's frame with HDTV, SRS, and DCDi logos, cluttering an otherwise clean design. The row of logos make the economy-TV look like it was suped-up by a teenage boy-racer who had gone crazy applying decals. Basic channel and volume controls are located on the back of the TV, an inconvenient location. Out of the box the Polaroid FLM-2601 LCD Television has the reddest picture I have ever seen on a television. Watching pro-wrestling using our cable connection using the built-in tuner I saw lobster-red-wrestlers slamming each other into the mat. During the faux interviews between body-slams I saw wrestlers and hosts engaging in dialog only slightly less convincing than the TV's color. To improve the TV's picture I started with the soft picture setting, which gives the best blacks of the 3 presets. I turned down the color to about 30 to curb overly red skin tones. I adjusted the brightness to 45 and put the contrast between 50 and 60 too keep blacks dark. Turning down the sharpness improved picture quality. Tint is the only setting that didn't need tweaking. Adjusting individual color channels is not possible on the FLM-2601 LCD TV. Two other presets bright and nature do not work well for the majority of video sources. In Catch Me if You Can, Frank Abagnale, Sr., played by Christopher Walken, had hair that looked like it was dyed black in an inkwell and pink rosy cheeks - I know he has neither. 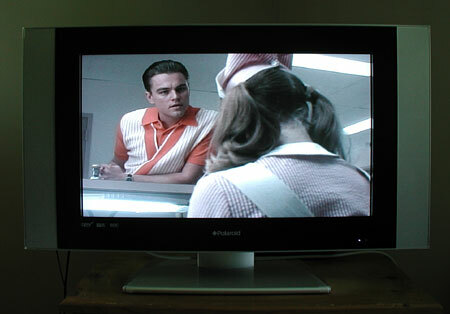 After adjusting the TV to display the indoor scenes with accurate darks, the TV rendered the women clad in 1960s, psychedelic bikinis that surround Frank Abagnale, Jr. (Leonardo DiCaprio) in washed out and drab colors. The Polaroid FLM-2601 never seemed capable of simultaneously producing accurate blacks and accurate colors in both dark and light scenes. Furthermore, when I adjusted the picture controls to get true-to-life color no setting would yield dark blacks in my well-lit viewing room. Outside of a 70-degree angle glare from bright natural light sources reflected off the screen and colors began to wash out. The television can zoom, or horizontally stretch 4:3 sources to fit on the 1366 x 768 HDTV screen. Native 4:3 sources are displayed in a dark black frame that suggests the display's 600:1 contrast ratio is no lie. Too bad the in-picture blacks do not gently graduate to the blacks we saw in the picture frame. The television comes with 3:2 and 2:2 pull-down filters to help curb noise. The LCD panel has a response time of 16 milliseconds. Eyestrain from motion artifacts wasn't pronounced when we turned down sharpness but we observed annoying streaking across the screen when a light object moved across a dark space. The streaking problem seemed to lie in the TV's electronics since no amount of waiting would clear the lines. Only disconnecting an input source and reconnecting the source would clean up an image on a paused frame. The Polaroid 2601 LCD Television comes with more features than you would expect for its price -- though none of the features are executed with polish. The FLM-2601 comes with two sets of component inputs, two sets of composite inputs, one DVI input, one VGA input, and one coaxial input. Inputs are housed in a tinny metal strip on either side of the back of the television. The jacks and cables are concealed under plastic covers and cables are routed through a clear-plastic coral at the base of the tilt stand. The plastic cable coral does not match the rest of the TV and looks like it was screwed on as an after-thought. Fortunately you won't have to look at it from the front of the TV. The 7-watt speakers deliver respectable sound for a television this size. Component audio out jacks allow you to listen to the built-in tuner through your stereo or home theater system. The built-in NTSC tuner was snappy, but picture quality wasn't anything to write home about. It does not include any fancy features like station ID and this TV does not have a CableCARD slot. There is no picture-in-picture support for displaying two video sources but you can watch a video source in a small window when using the VGA or DVI inputs, most likely with a computer. Since there is no built-in ASTC tuner you will have to connect HD sources via the component or DVI jacks. The on-screen menu and picture adjustment controls could use refinement. At their default size all on-screen menu fonts and controls are too small and occupy the center portion of the screen. One alternate font-size can be selected but it is enormous. Users will probably want to squint to see the smaller font size and reposition the menu controls to one corner of the screen. Since this TV was very difficult to get accurate color out of, and necessary adjustments varied widely depending on which input was being used, we would have liked to have seen per-input picture controls, not a TV-wide setting. At least providing separate controls for the built-in tuner and the A/V inputs would have been a step in the right direction. The remote control rates average in terms of design, functionality, and comfort. The television is 32 inches wide, 20.3 inches tall, and 9 3/4 inches deep with the stand and just over 4 inches deep without the stand. The FLM-2601 LCD TV weighs about 42 lbs and is assembled in China. Even after several hours of operation the television was not hot. Power consumption is 140 watts. The Polaroid FLM-2601 sells for about $1100. It is several hundred dollars cheaper than competing products from Sharp and Sony and a couple hundred dollars off JVC and Toshiba's offerings. While the FLM-2601 LCD TV doesn't fail at anything, it doesn't excel at anything either. For absolute bargain-basement shoppers it might be worth a look. For shoppers looking to stretch their dollars a larger, better EDTV plasma would yield better overall picture for about the same money—so would a smaller, better LCD.